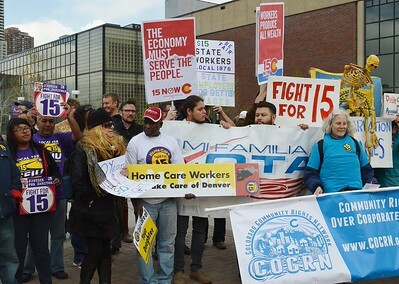 Fast food & home care workers rallied and marched for a $15/hr minimum wage in Denver Colorado. 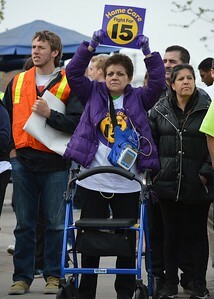 Members of various unions including SEIU, UFCW and Colorado WINS were among the protesters. 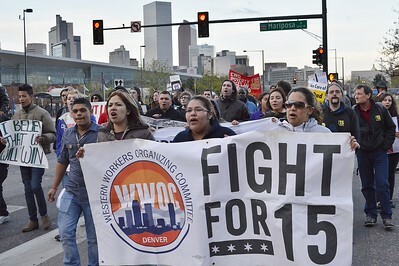 Three women shout while carrying "Fight For 15" banner, large number of marchers behind them with signs and banners. 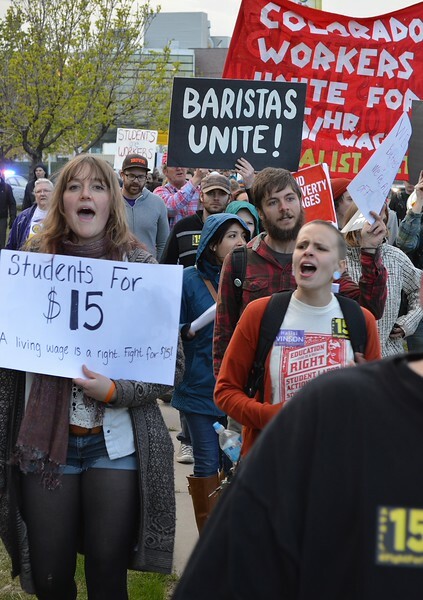 Young women carry banner that reads "Fight For $15", large number of marchers with signs and banners behind them. Large group of protesters holding signs and banners about raising the minimum wage to $15/hr, home care workers and state employees. One protester holds skeleton in the air. Two young women shouting while marching in protest, one holds signs "Students For $15", behind them large number of demonstrators with signs and banners, including one that says "Baristas Unite". Woman standing in front of walker raises "Home Care Fight For 15" sign above her head, other demonstrators standing around her. 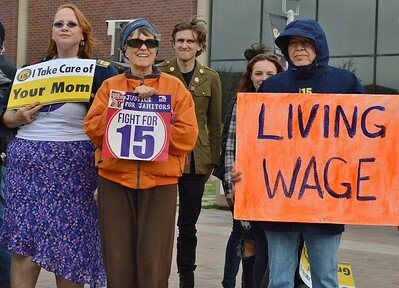 Three women holding signs about raising the wages of janitors and home care workers to $15/hr, one woman holds sign that says "Living Wage". 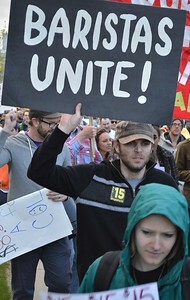 Man raises large sign "Baristas Unite" above head, more protesters with signs march behind him. 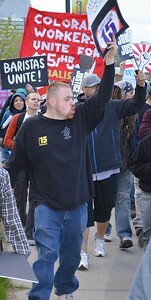 Man holding "Fight For 15" sign, in background African-American woman with 3 children. 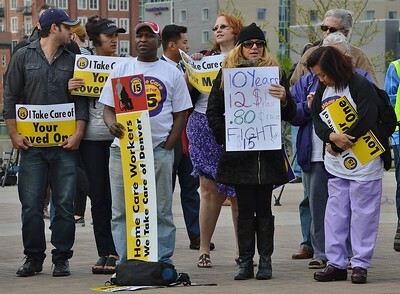 Group of home care workers holding signs at protest for $15/hr wage. 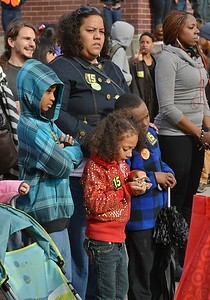 African-American woman wearing "Fight For 15" sticker, standing with 3 children, other protesters in background. 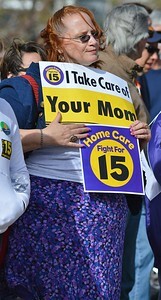 Woman home care worker holding "Fight For 15" sign and sign that says "I Take Cre Of Your Mother". 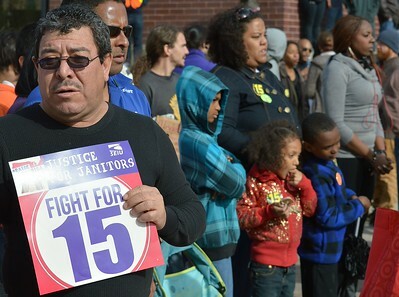 Woman wearing "union yes" button, holding sign "Fight For $15/hr, Fight For You". 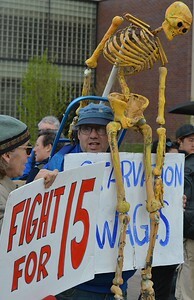 Man holding full size skeleton and signs "starvation wages" and "Fight For 15". Man shouts and raises "Fight For 15" sign above head, large number of protesters with signs march behind. 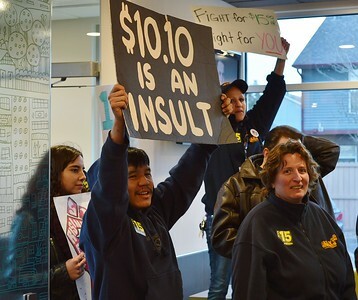 Young man raises sign above head "$10.10 Is An Insult", next to him woman with "Fight For $15" sign, woman wearing UFCW jacket turns and smiles. 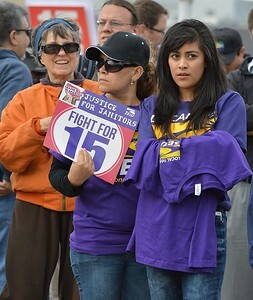 Woman wearing SEIU t-shirt holding sign "Justice For Janitors, Fight For 15", next to her young woman wearing SEIU t-shirt, and woman wearing sunglasses. 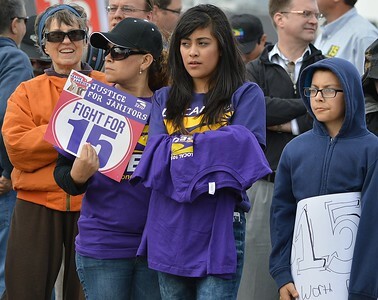 Woman wearing SEIU t-shirt holding sign "Justice For Janitors, Fight For 15", next to her young woman wearing SEIU t-shirt, and woman wearing sunglasses and young boy holding protest sign. 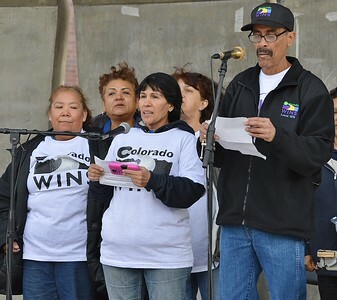 Man wearing "Colorado WINS" jacket standing in front of microphone reading a statement, next to him a group of women wearing "Colorado WINS t-shirts. 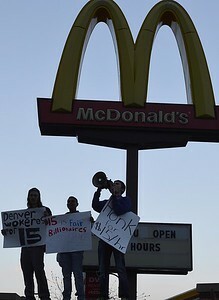 Three protesters with signs about $15/hr wage stand in front of McDonalds "Golden Arches" sign, one speaking into a bullhorn. 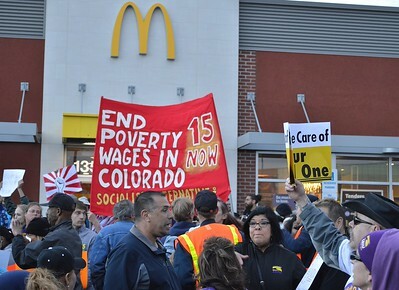 Large group of protester in front of McDonalds restaurant, some hold large sign that reads "End Poverty Wages In Colorado, 15 Now", in the background the "McDonalds Golden Arches" are seen on the side of the building.